Schemata Workshop will be hosting a model-building workshop for youth aged 11-16 on Saturday, March 26, in collaboration with the Seattle Architecture Foundation about the design of urban gardens (more information here). 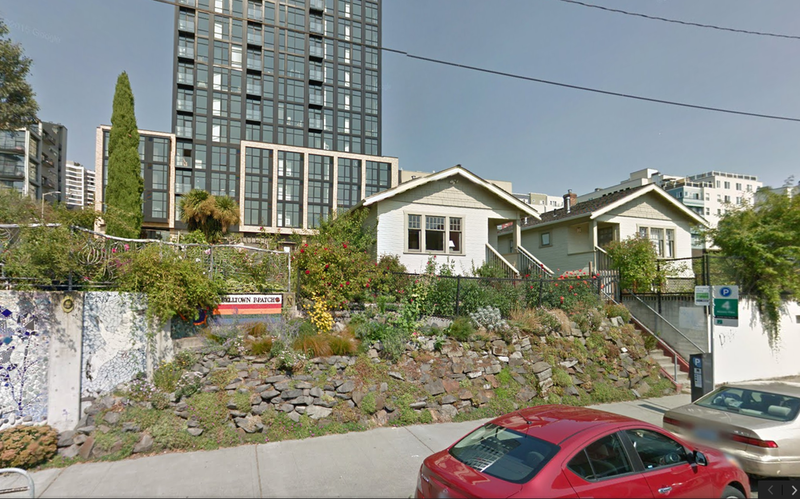 We'll be exploring the issues we faced while designing the rooftop garden with Seattle Urban Farming Company at our new space and cohousing community. This got our froggers thinking about their favorite urban gardens in Seattle. Here are some of our staff's well-loved lesser known parks in Seattle we hope you get to visit. Happy exploring! "I feel like Seven Hills Park is a hidden gem, so I almost don’t want to share it, but it’s such a great spot. There’s a little community garden, some public grills and picnic tables, a few trees for shade, and an ample lawn perfect for laying out a blanket and sharing a picnic, readinga book, or just soaking up some late afternoon rays. It’s a little off the beaten path, and with Volunteer Park and Cal Anderson Park nearby, most of the visitors to Seven Hills Park live in the neighborhood, which makes for a cozy community feel even on the most crowded summer day. "I like that people hang out there. It can be quite lovely on summer evenings to walk through and see people picnic as well as working on the lots." "I love how tucked away this park is – if you’re coming from 10th it’s easy to miss the stairs that lead down to it. The hillside gardens are really beautiful and have a wildness to them that I really like. There also is a pretty great view of Lake Union and the Olympic Mountains from the top." "The Loveless Building scale is outstanding along the sidewalk, as is the material textures, and expression of uses. The glimpse of the courtyard seen passing by the gate is very compelling, followed by the traditional sequence of compression of view in the tunnel, and expansion into the garden, and the tree canopy overhead." "Waterfall Garden Park is such a secret oasis in the middle of the of Pioneer Square. I love taking visitors there when touring Pioneer Square since the waterfall and lushness makes for a nice break from the noise and harshness of the city." "While there is a lot of critique regarding the Federal Courthouse Plaza, and though some of it is valid, I just really love the space." "Guerilla Gardening happens when people garden in places where they don't have a legal right to utilize the property, like these little traffic roundabouts that you find all over Seattle. I find it so neat that people have taken it upon themselves to garden wherever they can and to beautify their environment. It really adds to the city." *All images courtesy of Wikimedia Commons and Google Streetview.